"We always wanted the 100Mbps service," she said. "When the price came down, we jumped on it." Greenlight, the city of Wilson's fiber-optic broadband network, has close to 5,600 cable, Internet and telephone subscribers. Greenlight sells its 100 Mbps symmetrical service, with the same upload and download speeds, starting at $149.95 per month as part of a package. Greenlight's 60 Mbps start at $99.95, 40 Mbps at $74.95, 20 Mbps at $54.95 and 10 Mbps at $34.95. Greenlight's 40 Mbps is becoming increasingly popular with customers, said Brian Bowman, Wilson's public affairs manager. Internet-service providers can't have it both ways. They can't delay bringing high-speed service to North Carolina communities but then turn around and lobby the legislature to deny local governments the authority to establish municipal service if their residents want it. Had the private companies tried to make their argument 15 years ago, they might have deserved some sympathy. But not in 2011. The Internet and high-speed access to it have now been available in North Carolina homes for well more than a decade. They ignored a market, and local governments stepped in to provide a critical service. The legislature should kill this bill. Citing the economics, private Internet providers have been slow to invest in the high-speed infrastructure that would connect these rural communities. That has a lot to do with why North Carolina ranks a paltry 41st in the nation for broadband access, according to Census Bureau statistics. Having been snubbed by the private providers, some communities like Wilson and Salisbury have taken the same approach as they did 66 years ago: opting to build their own state-of-the-art systems when the commercial providers refused. Now the General Assembly, through a bill sponsored by Rep. Marilyn Avila, R-Raleigh, aims to throw substantial roadblocks in the way of communities seeking to serve themselves. In many ways, the issues involved aren’t very different from when investor-owned electricity providers were unwilling to bring service to small town and rural North Carolina early in the 20th century. By the 1930s, the federal and state government were taking steps to encourage rural electrification and the formation of electric co-ops, including providing loans needed for the construction of the systems. One of the first electric co-ops in the country was formed by Edgecombe County farmers. Perhaps North Carolina legislators ought to contemplate what the state might look like today if their predecessors had quashed the aspirations of those farmers, rather than giving them tax breaks. For a more substantive review of what folks in North Carolina are saying about this bill, Stop the Cap! has a great run-down. "I am confident, at some point, that the state law will address this," said Marcus Trathen, an attorney with the [cable] association. "We have never said that cities should be prohibited. If they compete, they should be subject to the same rules as private companies." We have already detailed (at the bottom of this post) the many ways this bill will introduce bigger barriers and unique regulation for public networks that do not apply to companies like TWC, but let's quickly refresh with two examples. If Trathen wants the same rules, then TWC will abide by the open meetings laws and publish budgets, business plans, etc., for the public to review. And communities get to vote on kicking TWC out of town. This bill must be redrafted not to prohibit communities from offering service outside town. 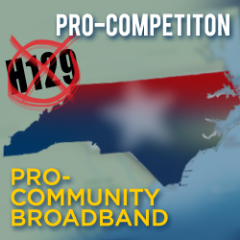 NC law makes it very easy for TWC to offer state-wide service and communities should not have a barrier to do similar. There you go, anyone reporting the lie that this is "level playing field" legislation should be confronted with the facts. Things are looking way up in terms of preserving local authority to build these networks. Thanks to the rapid and enormous public outcry (making phone calls to state Reps can make a big difference! ), the bill was slowed down so the public could get a better sense of exactly what TWC and Avila were conspiring. Salisbury's Fibrant, realized this bill posed an existential threat to its future (despite the public lies of Rep Avila who claimed it did not target existing networks) because the bondholders need to be repaid regardless of whether TWC convinces the Legislature to shut Fibrant down. They hired a lobbyist. This came after their Mayor worked long and hard to get the Legislature to understand what it was messing with. At $5,000/month, the cost is a pittance compared to the damage of allowing TWC's bill to shut down Fibrant (to clarify, the bill currently does not threaten Fibrant due to Rep Warren's amendment -- but TWC will do everything it can to remove that amendment). We have long maintained that these issues have little to do with partisan politics and Salisbury's new lobbyist proves that point. Council committed to use Fetzer, the outgoing N.C. Republican Party chairman and a former mayor of Raleigh, for one month and could retain him throughout the legislative session, which ends in July. Preserving local authority cuts across Republican/Democratic Party lines. What often matters far more is how much cable and telephone companies have contributed to election funds for candidates. And finally, another opportunity to promote the video we produced showing why community networks are so important in North Carolina.